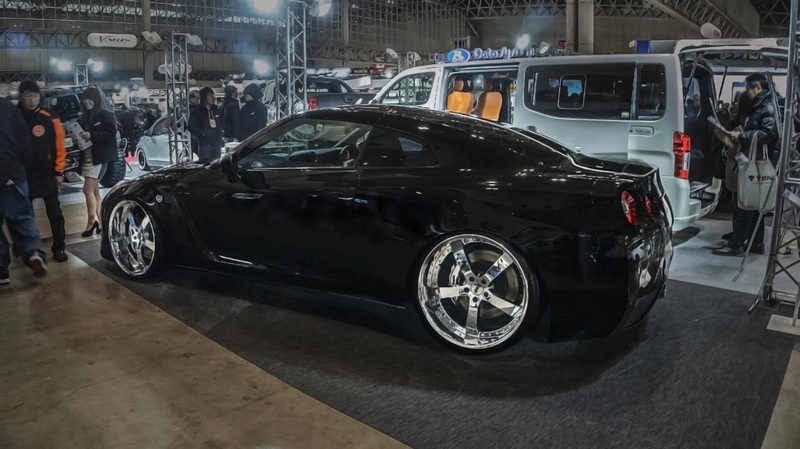 I've been visiting Tokyo Auto Salon for a few years and not a single time it failed to surprise me. The event can be described as SEMA of Japan, but as it is being open to general public it has a completely different atmosphere. Much more attention is being paid to presentation as it takes a degree in marketing to lure average Joe to your booth. Race queens play a role and are largely responsible for such incredible attendance numbers, as over 200000 tickets are sold each year. But for us, genuine petrol-heads this is a chance to witness some of the most amazing rides the Japan's after-market world has ever produced. and they are quite insane. 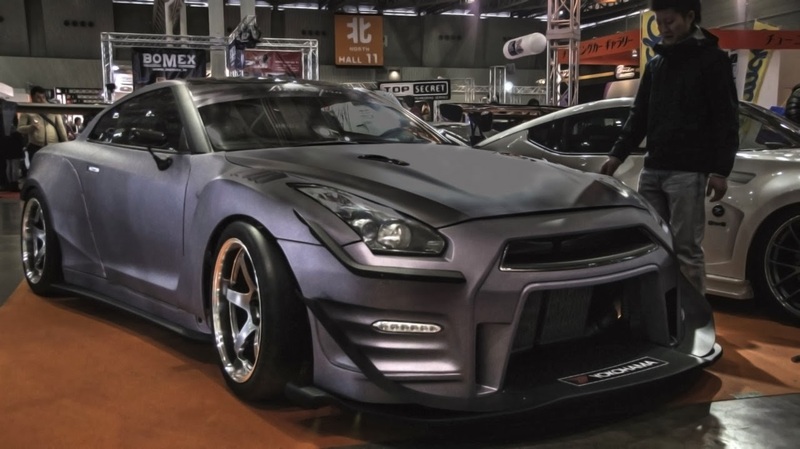 Every car enthusiast knows how good Japanese are at tuning and customizing, as their craftsmanship and attention to detail are unmatchable. But here it's been taken to next level. 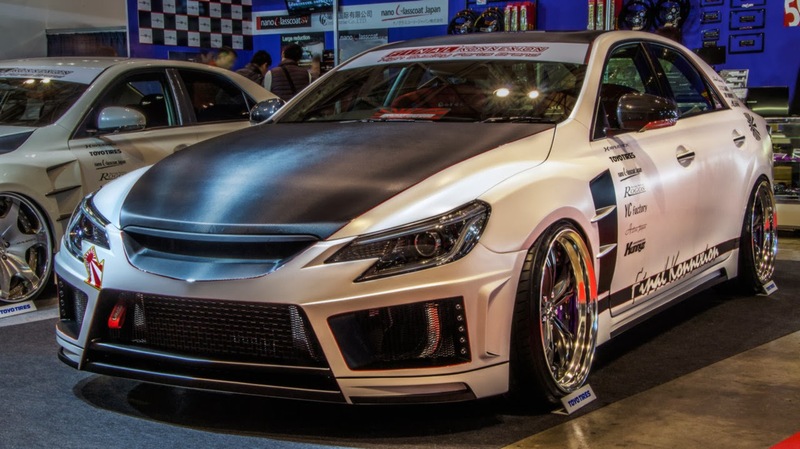 The theme of wide-body performance machines seems to have been carried over from SEMA. 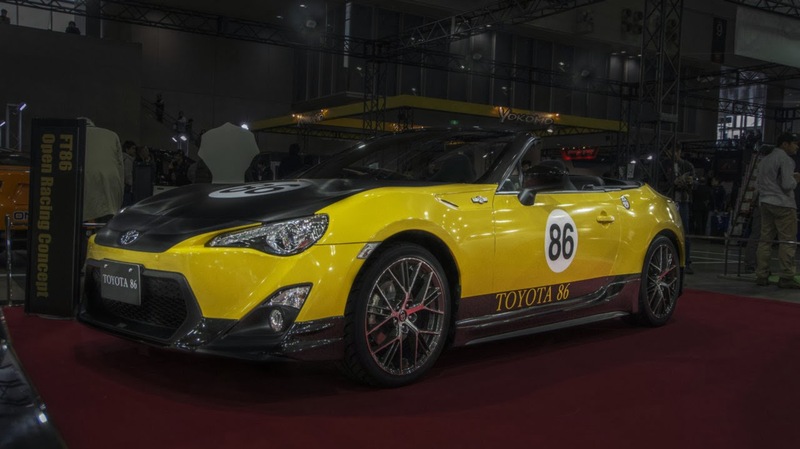 It is therefore expected that we would see a number of Toyota 86's with Rocket Bunny kits,..
..and TRA Kyoto did not disappoint, but as always, a body kit is just a part of the story. 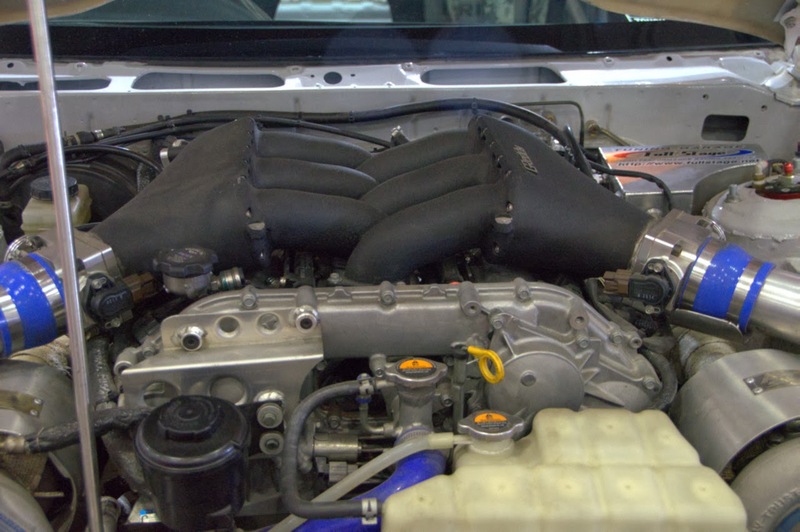 Hachiroku tuning is nothing new, but it never gets old, as this compact monster is running a V8 engine with individual throttle body setup, I can only imagine how this linear power delivery would transform this machine into a perfect drift car. On the inside it has been converted to full race layout featuring Nardi steering wheel, Bride bucket seats as well as race pedals and sequential transmission. With such low stance on Work Emotion wheels and massive negative camber subtlety is not an option. 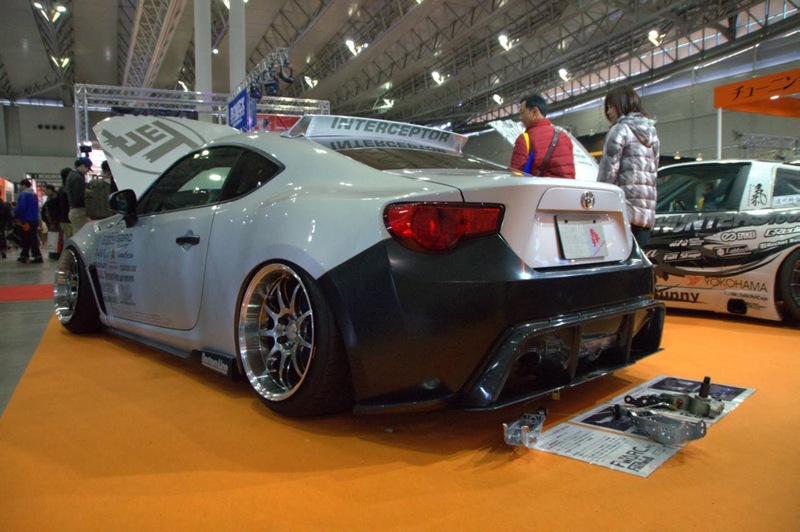 Same could be said about this USDM LHD Scion FRS sporing same Rocket Bunny kit, beautifully welded onto the body to make it look almost seamless. The 19 inch Work wheels and unique cherry red paint job complete the visual awesomeness of this car. But as clean and smooth this car is on the inside, it is just an appetizer for what's under the hood. 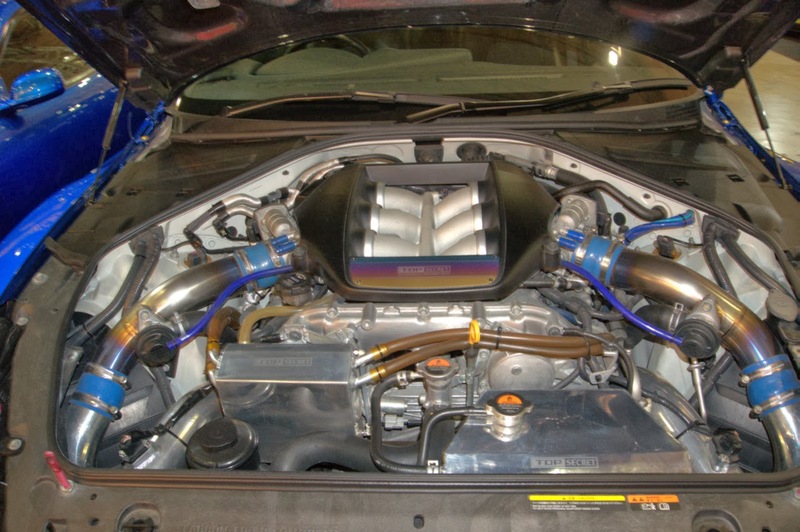 Same principles found on the outside were followed in the engine bay, and despite not producing the most power it was one of the most crowd pleasing of the show. 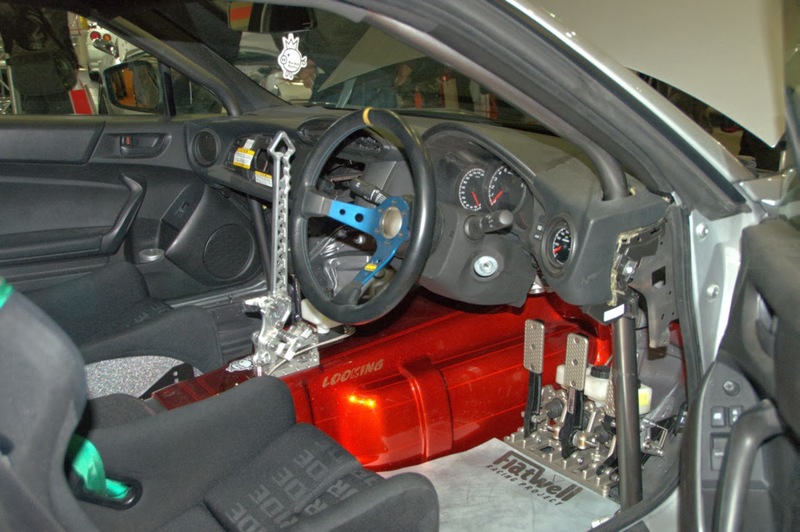 This is undoubtedly the nirvana of NA tuning. Although may seem like something else at first glance, this is the original Subaru's Flat-four. 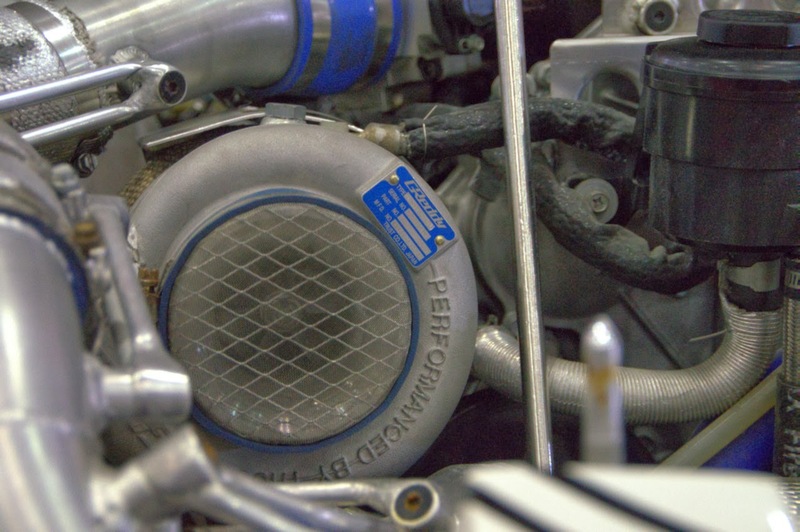 With Individual throttle body setup it should sound as good as it looks. The boys at Kuhl had a different vision, however and created something out of the ordinary. 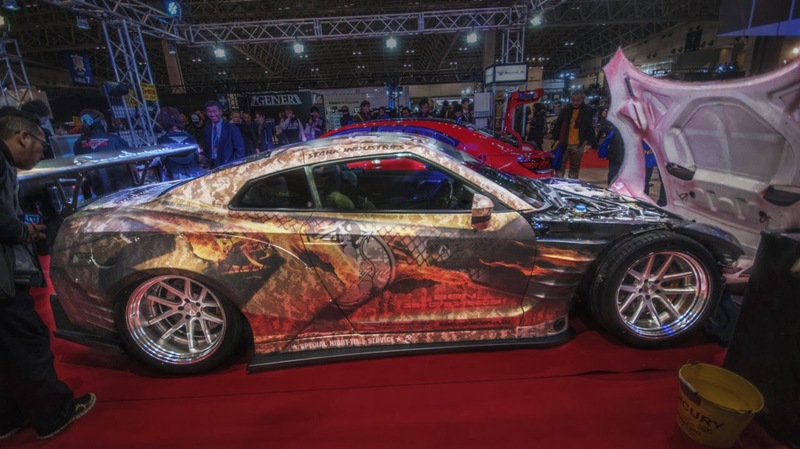 The fish-skin theme is actually a carefully laid out paint The design may be too much for some, but it does tick many boxes with choice of body kit and use of LED lights. More LED's followed in the rear with these unique tail lights. 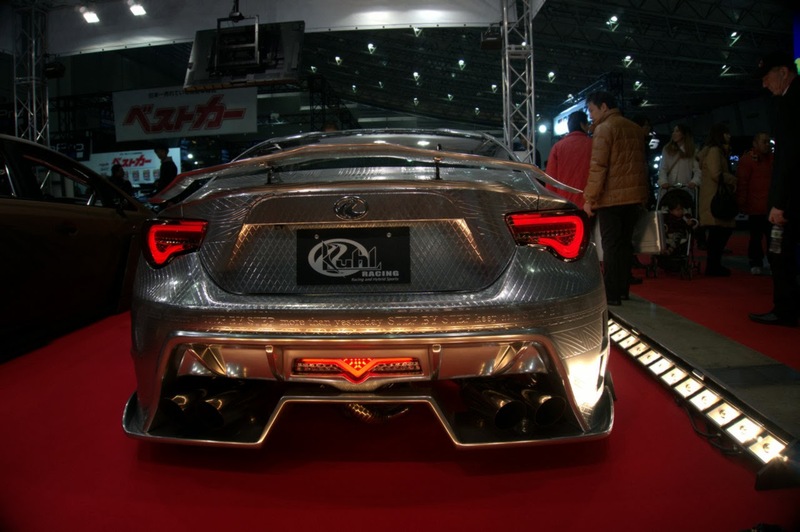 Massive quad exhaust suggests that this car has plenty to say about performance. We'll be watching the development of this vehicle as we go along. 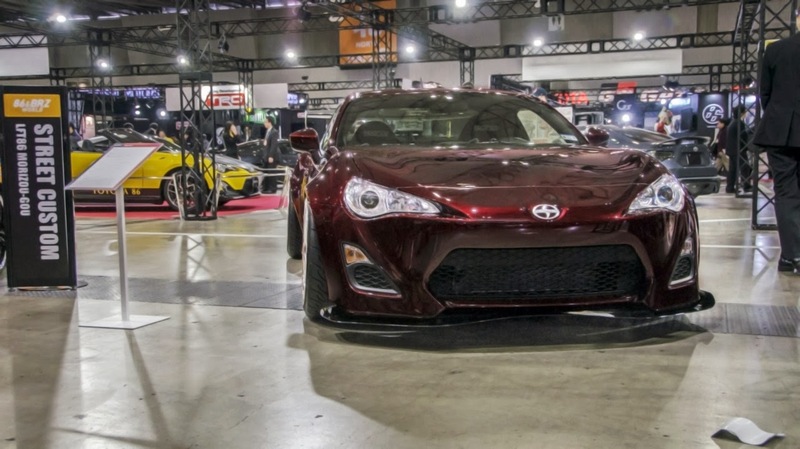 There were more subtle and down-to-earth versions of the Hachiroku, such as this FRS, making its return to Japan after display at SEMA. 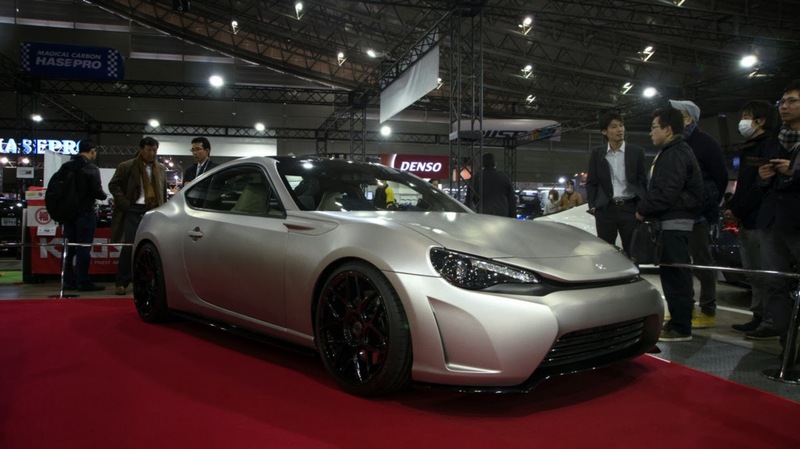 Of course we had a look at this luxury coupe at Hachiroku Style event back in August. 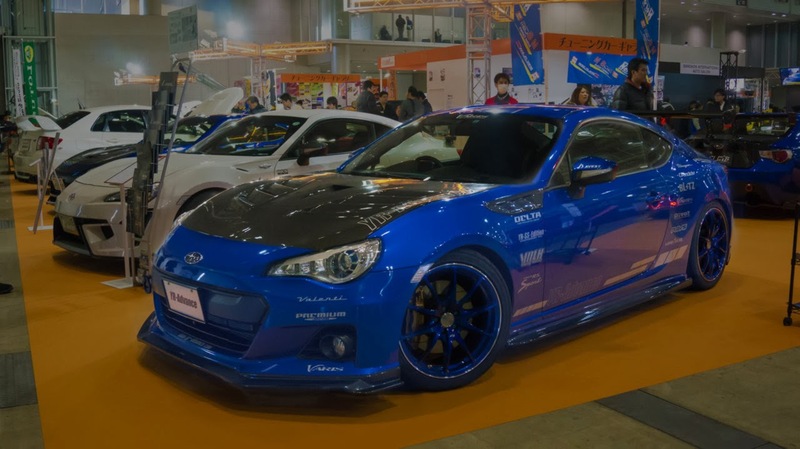 Right next to it was this Japan-only MarkX tuned by Gazoo racing. 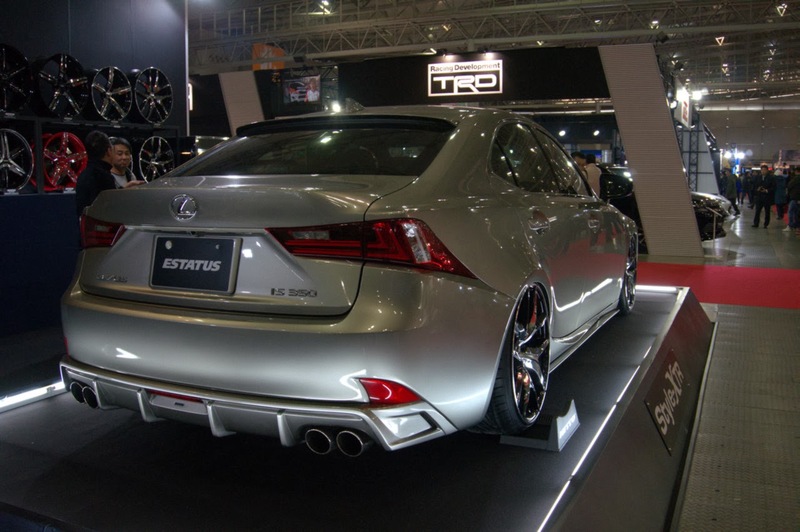 The FR four-door shares its base and engine with Lexus IS and enjoys its share of popularity in domestic market as affordable sports sedan. The MarkX has been a popular base for tuners as well, as its sleek shape and common design provide plenty of room for different possibilities. Fast and Furious themed Supra, however was very hard to walk by. 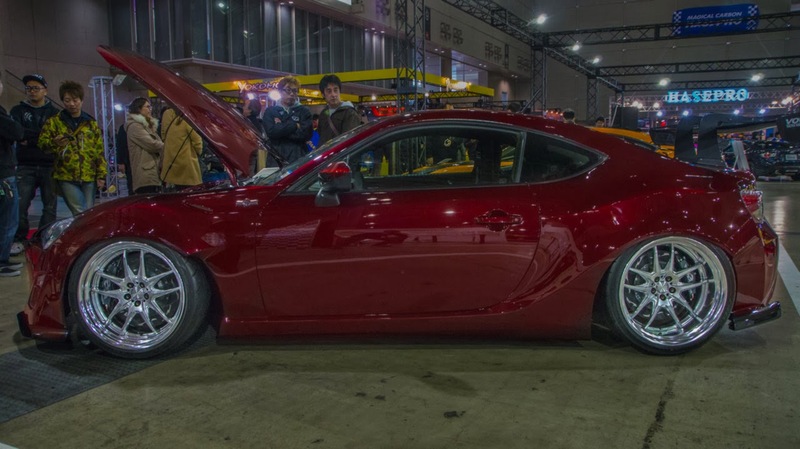 Lexus IS's popularity among tuners is growing very rapidly. 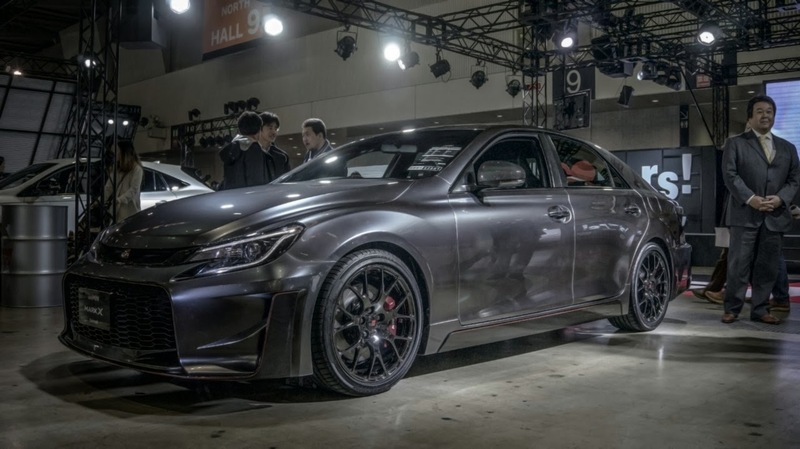 Most updates are primarily visual, but many wheel manufactures are now using the IS as their show car due to its extremely modern design and sporty appeal. 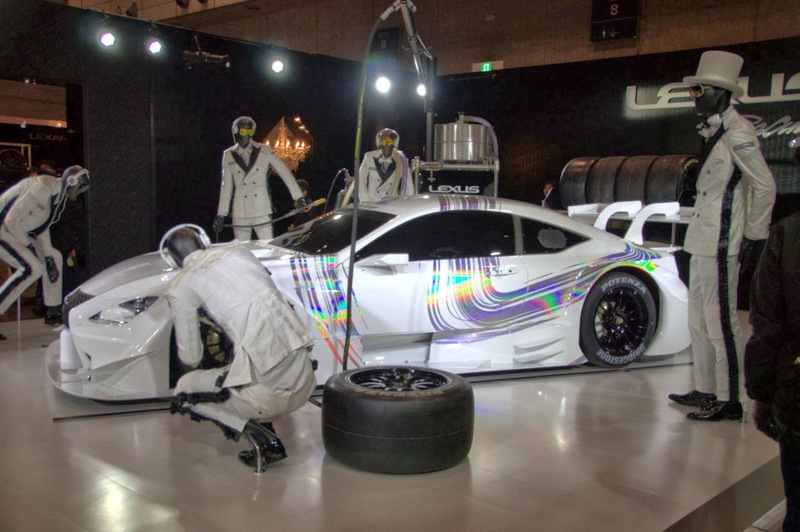 At Lexus's own booth the only presentation was for their RCF GT car that will be featured in this year's Super GT. 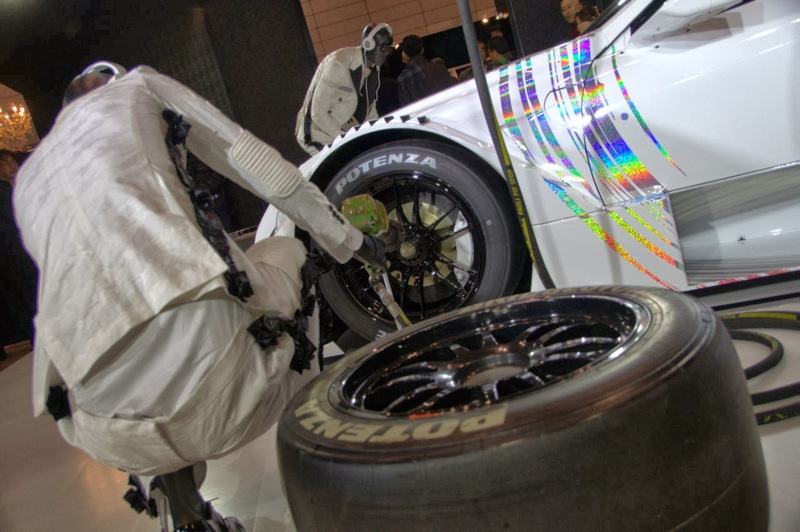 With revised rules and brand new cars from all manufacturers this year's Super GT will be interesting to follow. 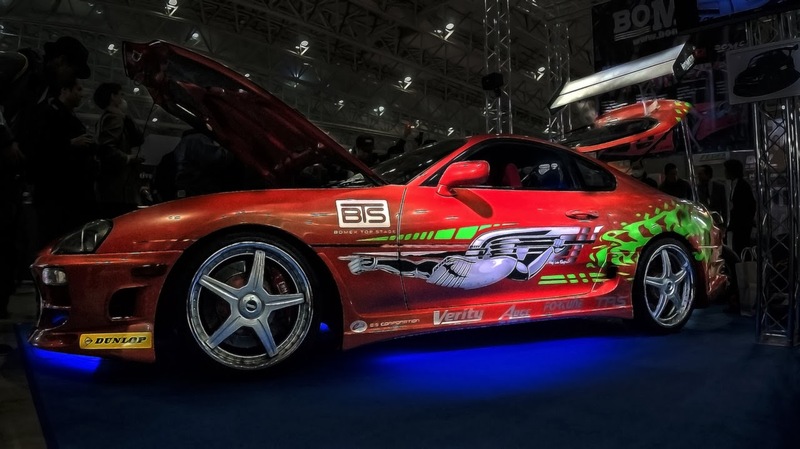 Back on the exhibition floor, tuners were showing their passion for the out of production RX-7 as different versions were present in numbers, but the most astounding was the one driven by Mad Mike Whiddet. 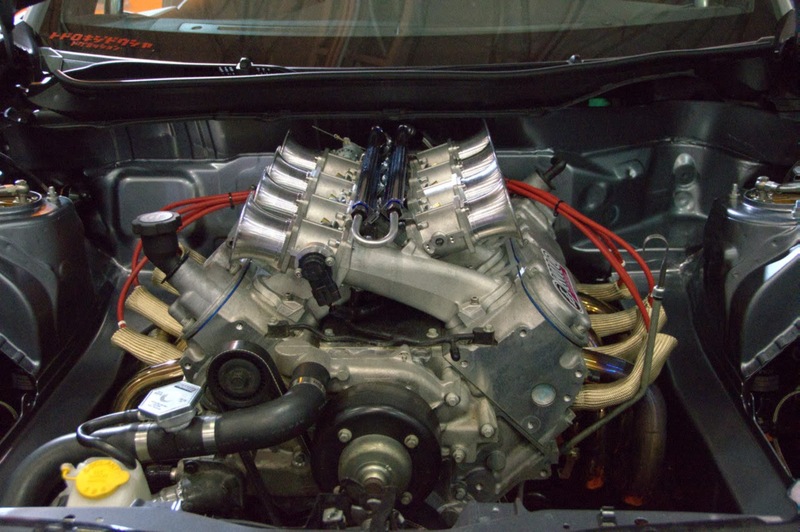 The twin turbo engine made its way to quad rotor NA high compression power plant producing 500 horse power and earth shattering race-car noise. 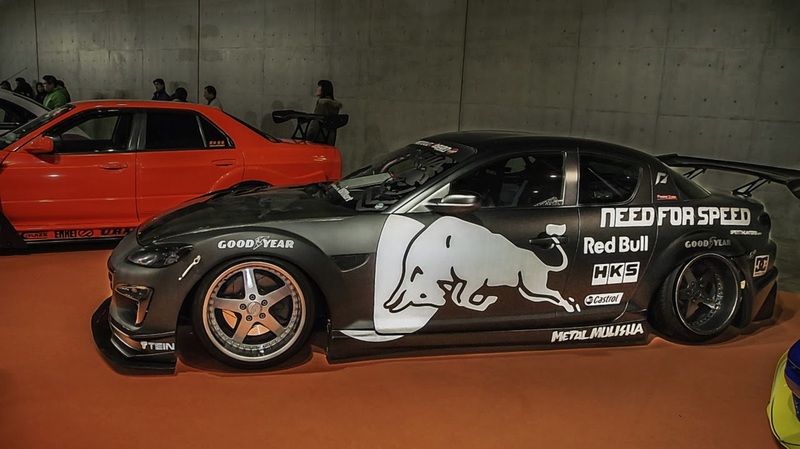 A few RX-8's were also present representing various styles and tuning options. 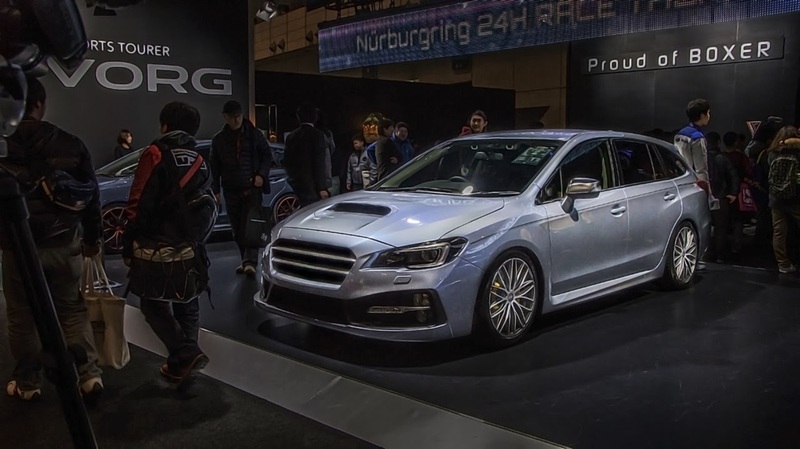 Subaru also has been silent in terms of performance vehicles, but are hoping to lure their fans back with the new Levorg. There were several versions of the new station wagon on display, but I am yet to see how Subaru fans will react to the 300 horse power CVT machine. 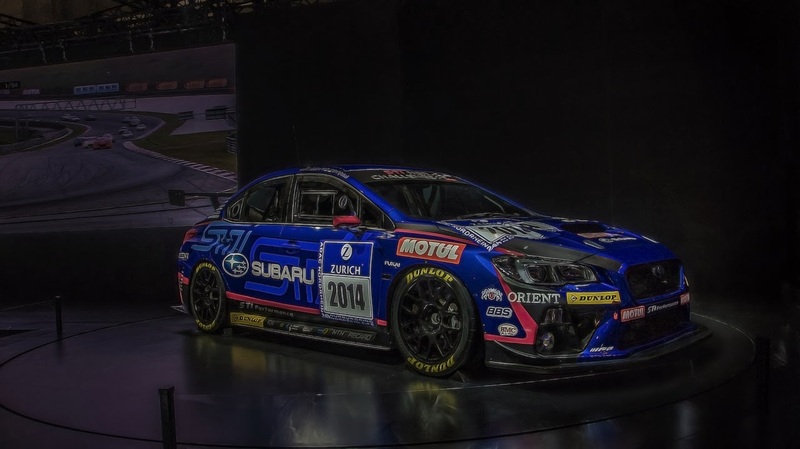 More attention was given to the new WRX Sti being premiered in Japan for the first time in its racing colors. 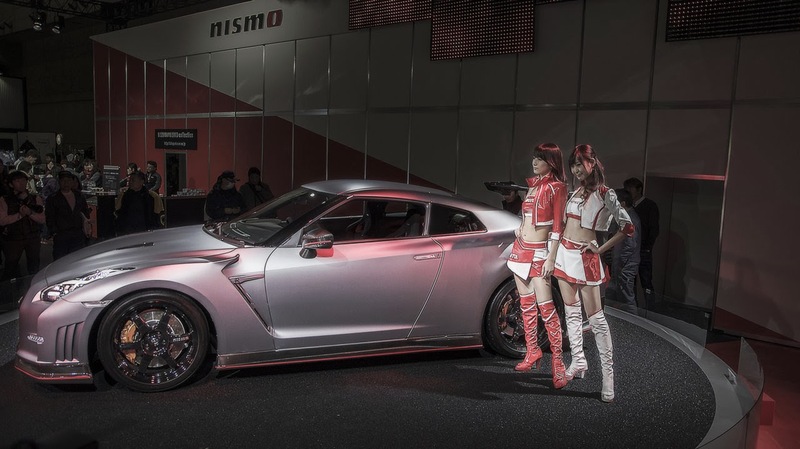 Majority of the JDM machines present at this year's Auto Salon were made by Nissan, which has put on quite a performance at Tokyo Motor Show. 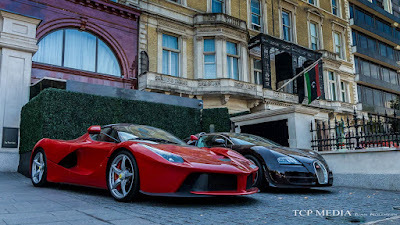 Their incredible success with GTR, 370Z and the Infiniti brand vehicles also ensured that they would be present in numbers. Yet it is their older models that are responsible for most jaws hitting the floor, such as this used to be 180SX. 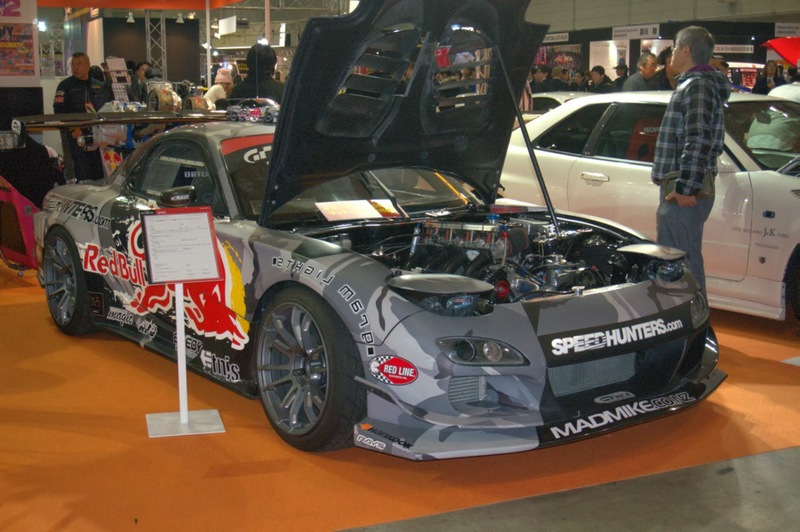 Sporing a Ben Sopra wide body kit, it is now is known as 380SX,..
..as the it is fit with VR38DETT from the R35 GTR. Additional couple of TD06-25G turbo chargers, a 4.0 Stroke kit, and other enhancements bring power output to excess of 1000 horses. 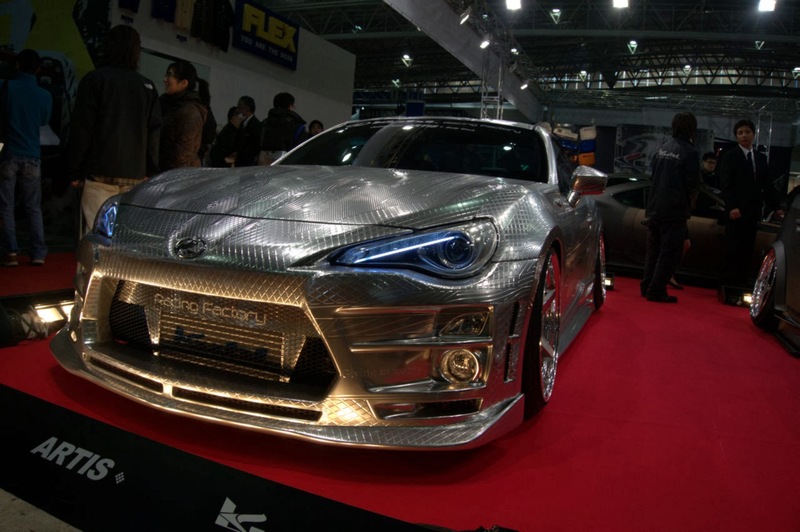 This car is one of the highlights of Japanese tuning world and was named car of the year by Speedhunters magazine. I am sure we will come across it in the near future, but now we have to move on. 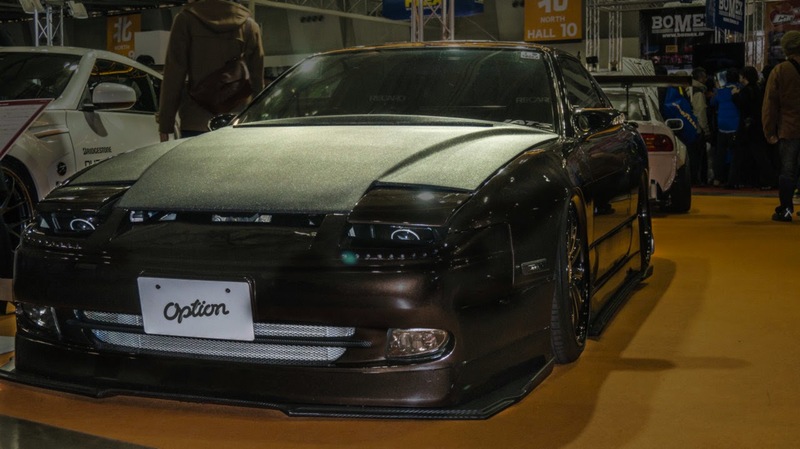 For more dark-side 180SX this pearl brown colored Nissan had a very unique tarmac looking bonnet. 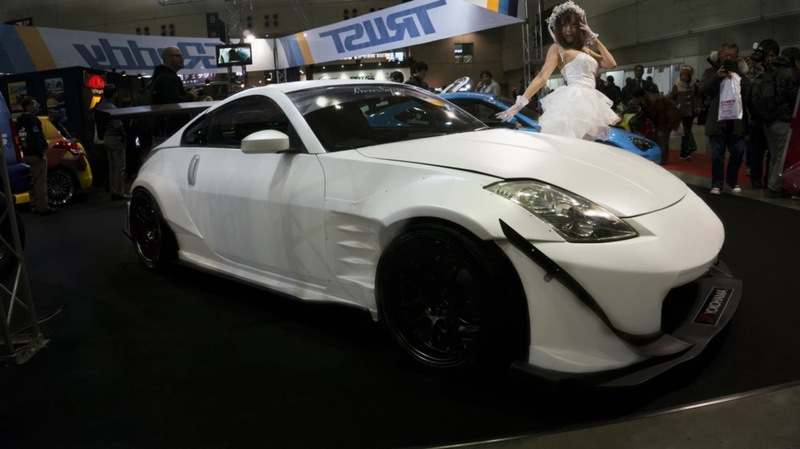 Ben Sopra Body kits were present on even more cars such as this 350Z at Trust booth. A very unique design making the Z look very aggressive and modern. 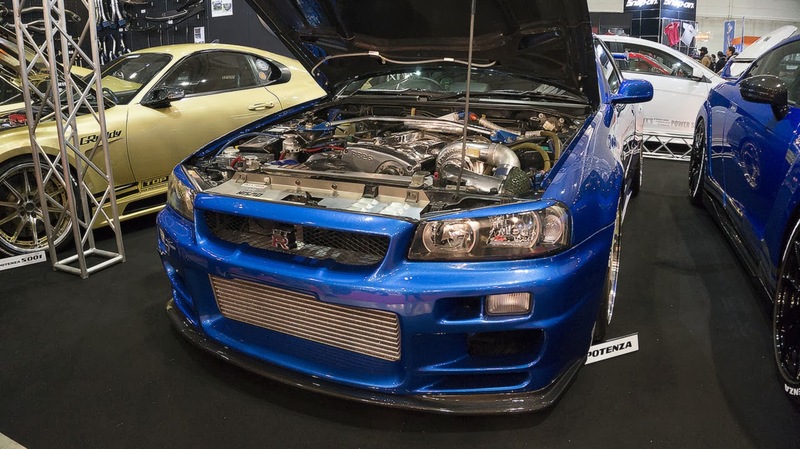 The show had plenty of the R34 GTR's this year as well. With limited production numbers, brutal performance, phenomenal tuning potential, and even Hollywood fame it is one of the most sought after cars. 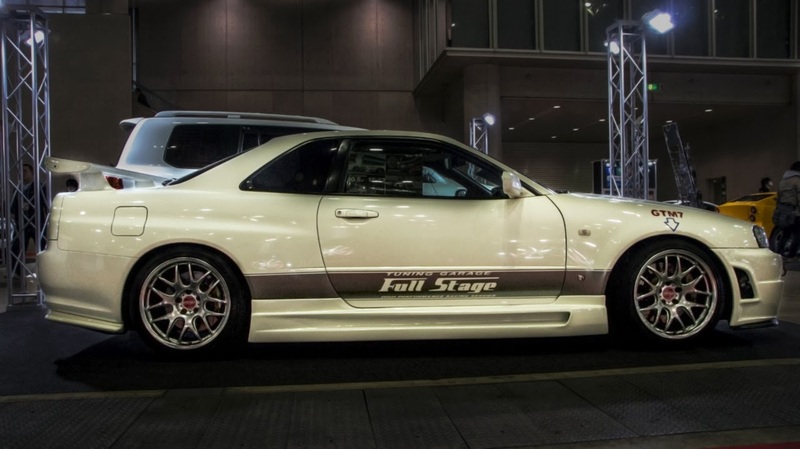 And speaking of tuning, Top Secret went all in to tune to customize this R34. With Engine stroked to 2.8L, with addition of HKS turbo and fuel management system it produces 850 horse power. Completely redone custom pearl Bayside blue completes the setup. The engine here received plenty of tuning touches in usual Top Secret manner. Some may even remember it from my last post as it showed up with another Top Secret project car to Daikoku PA for New Year car meet. Sometimes I forget how awesome the car culture here is; where else tuner demo cars just show up to unsanctioned meets? 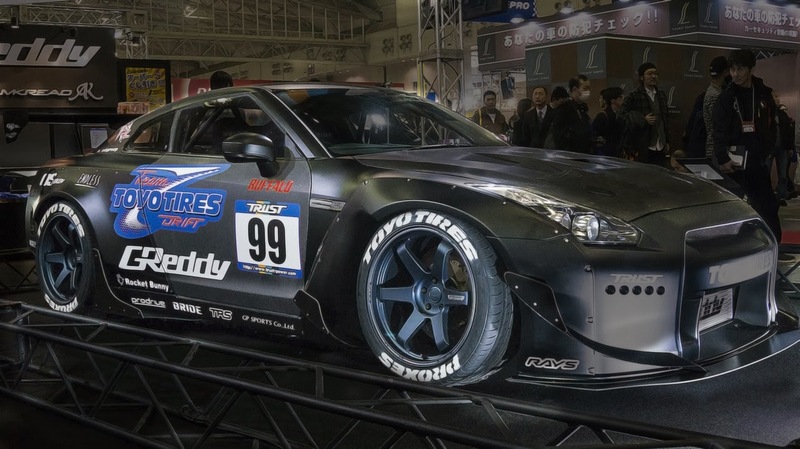 Across the hall from Top Secret was Trust, which is how Japanese know GReddy and they have presented this no holds barred rear wheel drive GTR drift car. 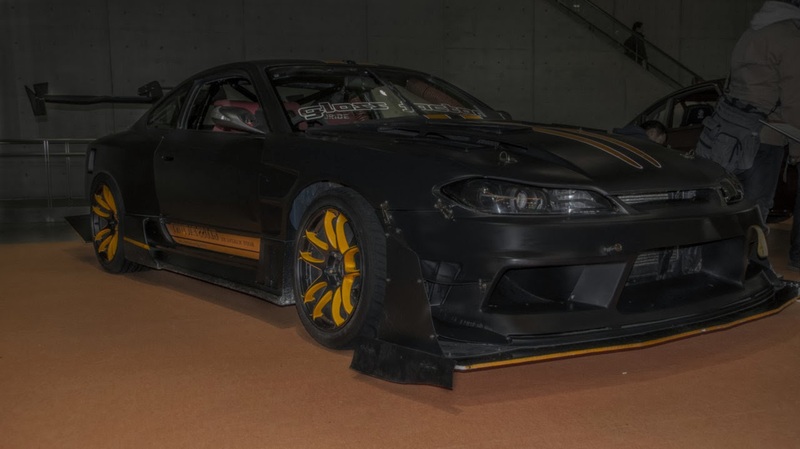 With Kei Miura designed wide body kit, a 1000 HP engine, sequential gear box, and re-worked suspension should make this a very capable drift car and add quite a bit of spice to 2014 D1GP. 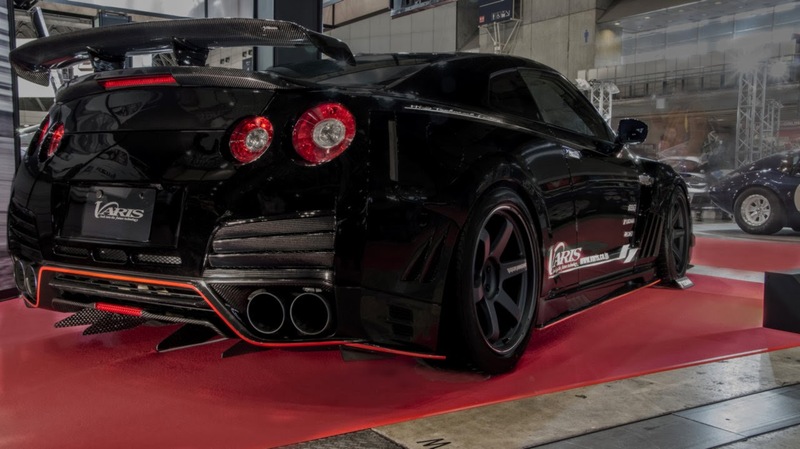 This project however, is a road legal version of the R35, but as already introduced at Nismo Festival last December, it is a full dry carbon conversion. 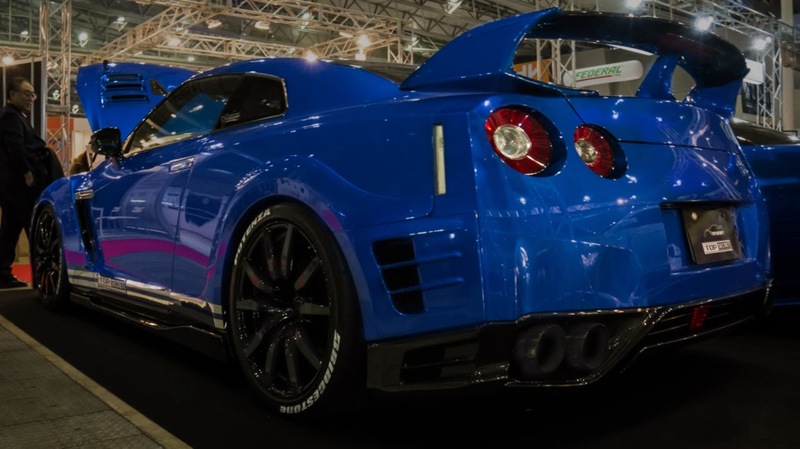 It should definitely help the GTR to shed a few pounds off, while Amuse Power exhaust and remapped ECU should gain those precious horse powers. With Overtake Garage gaining popularity, I will try to feature more of this car as we go along. But as with anything, Ueta-san from Ben Sopra had a different view, and his creations are anything but subtle. 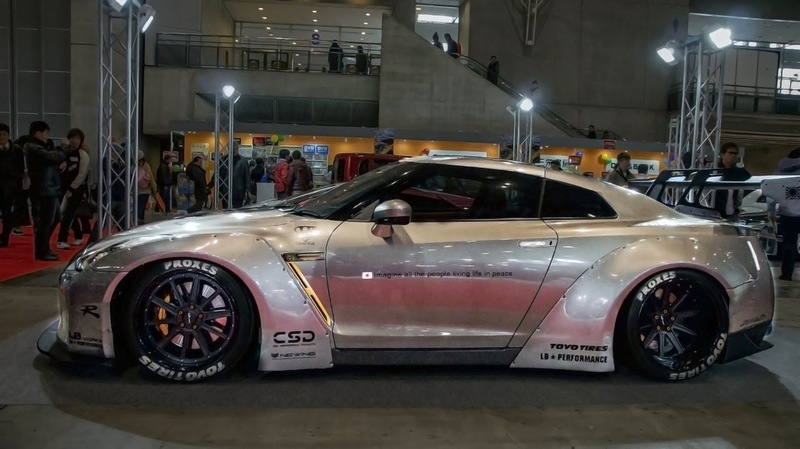 Naturally, most of his customers would share the same thought, as would the owner of this R35 with bizarre artwork. 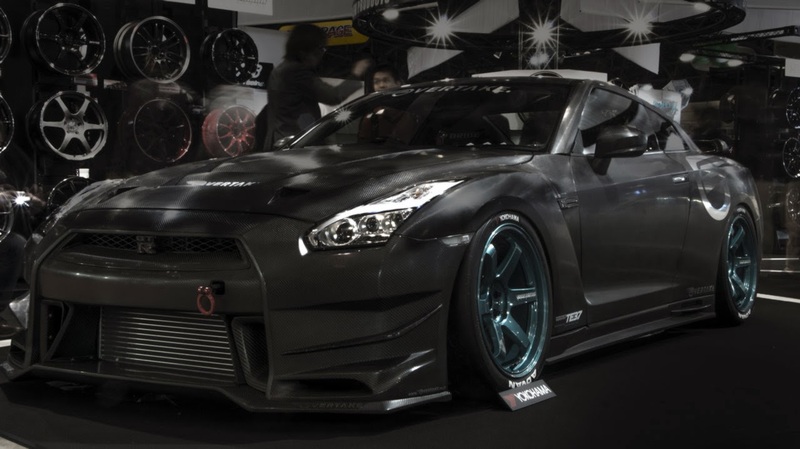 It is when we arrive to Liberty Walk, probably the most flamboyant of the Japanese tuners. 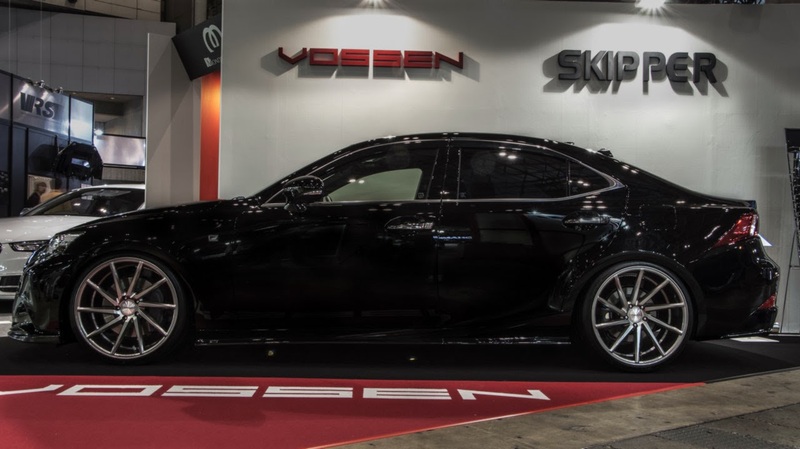 Having dominated SEMA with a collection of his cars Kato-san had similar plans for Tokyo Auto Salon. 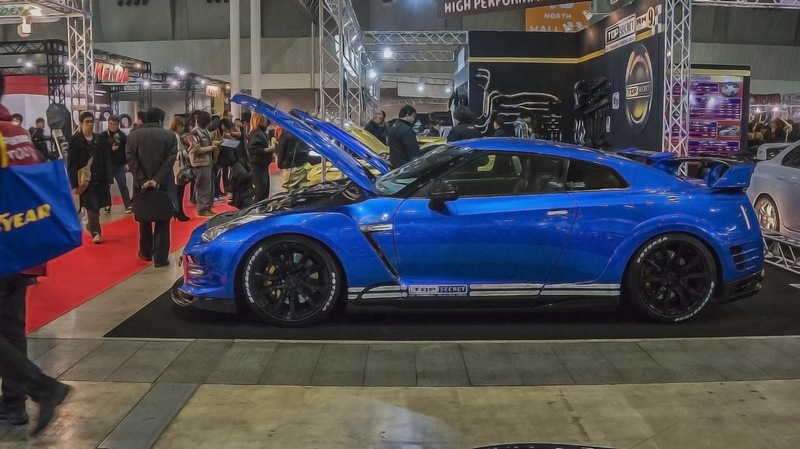 This GTR is just a small glimpse of what he has in store,..
..and the beautiful Kenmeri GTR probably tells a whole lot more more, as although known for his work with Lamborghini's and and more lately Ferrari's, this is LB-Walk going back to their roots - the ultimate JDM classics. Thank you for reading, everyone. 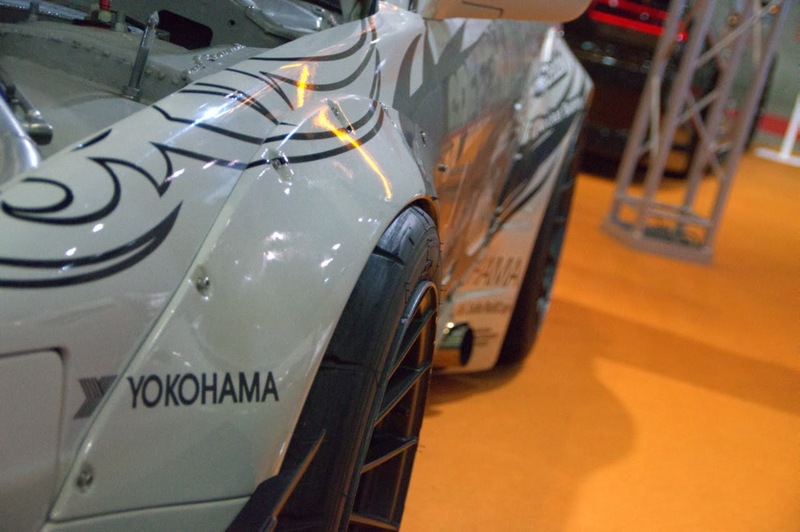 We will be back with more Tokyo Autosalon features later.